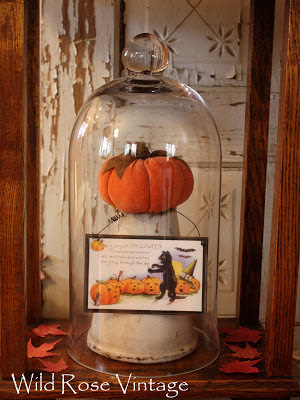 I'm joining Marty's CLOCHE PARTY, please stop by her blog to visit her fun party! 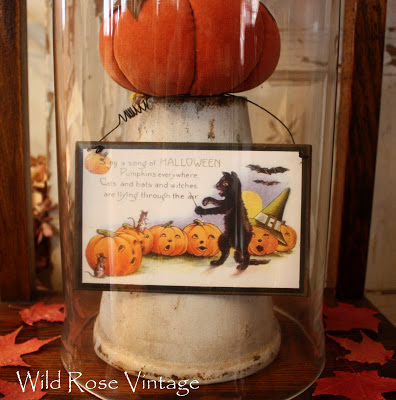 I found this tall cloche last spring at a sale and have never put it to use until I spotted Marty's party on Barb's blog. Be sure to stop by Barb's blog too (HERE)and see what she did! I love it! Anyway, I started playing around with an old cast iron pot, turned up-side-down, placed one of my velvet pumpkins that I made about 10 years ago on top of the pot, hung a simple copy of an old postcard on the pot and placed the cloche over it. Added a few pressed maple leaves and some old brown books. I'm quite happy with how it turned out and so simple! I love this!! Just say autumn, cloches and old books... and I'm there. Cloches are so awesome!!! Love your fall one! Your pumpkin is so cute. I made a couple sweater ones, yours is much better! That all turned out so cute. 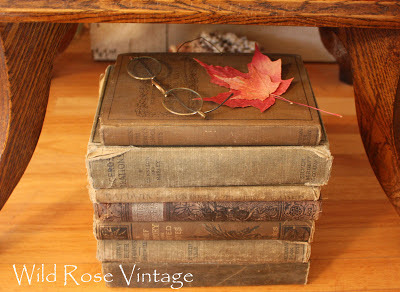 Love the idea of the upside down piece for your pumpkins, and your old books are great! and so sweet of you to mention me and link to my place. I like the fall simplicity of your decor. Just the right touch! What a terrific imagination you have, Faye. 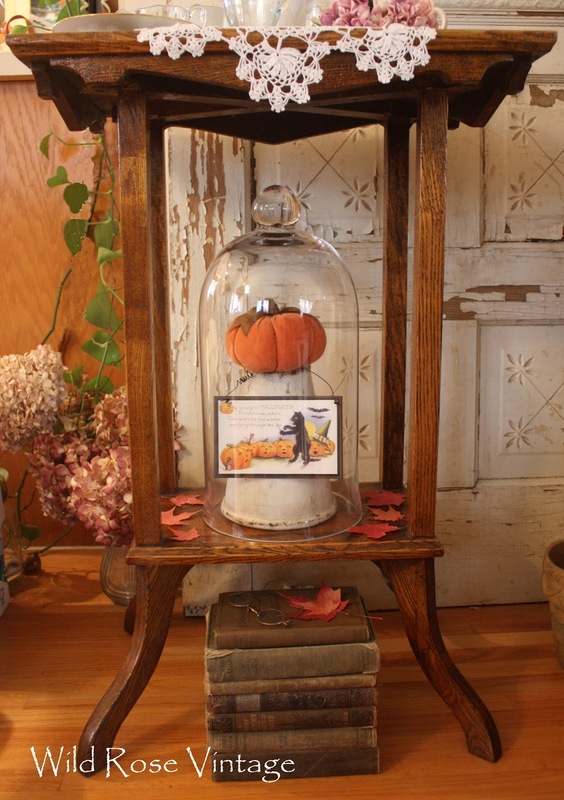 This is my first visit, and I'm so glad I came and saw your pretty pumpkin on a bucket under a cloche. That postcard is just perfect! Please come visit me and see my cloches. 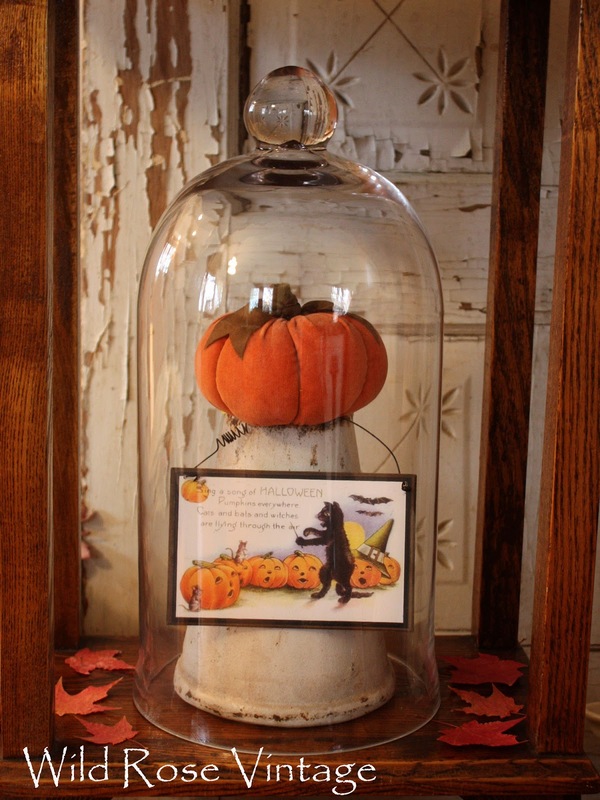 I love this pretty vignette you created with your cloche. Sure looks great together, Faye! Hope you're enjoying the onset of Fall, and that all is well! So pretty, Faye. I love the warmth of the Fall colors, and the feel of the vintage pieces you've used. You are always so creative. Ooooh! I wish I had seen this fun party! Love what you did with yours and your book vignette. What a great display with the cloche! Love your Halloween themed cloche vignette! I have got to get my cloche out and use it!